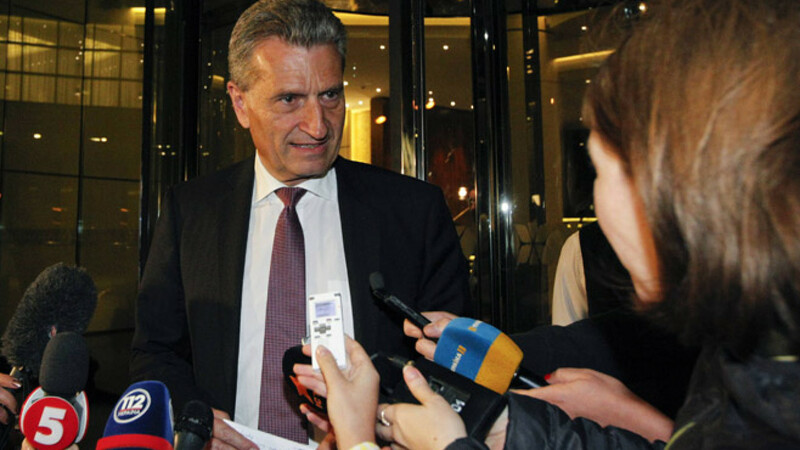 Guenther Oettinger speaking to reporters after gas price talks between Ukraine and Russia in Berlin on Saturday. LUXEMBOURG — Negotiations to bring Russia's giant South Stream project into line with European Union law are pointless as long as Moscow is asking the World Trade Organization to review the bloc's energy rules, Europe's energy chief said. Russia's Gazprom plans to build a giant pipeline named South Stream on the bed of the Black Sea to Bulgaria and then to Austria to ship gas directly to the EU, bypassing Ukraine, through which a large part of EU gas supplies currently travels. The European Commission says the pipeline breaches many EU regulations — on intergovernmental agreements, procurement, and free market rules that prevent gas producers from also owning the pipes used to transport it. The already troublesome issue has become politically loaded since Ukraine's pro-Moscow president was toppled, after which Russia hiked gas prices to Kiev, which it refused to pay. As the relations between the countries deteriorated, Russia annexed Ukraine's Crimea region and is threatening to cut off gas to the rest of the country if it does not start to pay its bills. At a meeting of EU energy ministers in Luxembourg on Friday, Bulgaria, which signed a bilateral agreement with Russia that has not been ratified by the EU, urged the EU executive to resume negotiations to bring South Stream into line with EU law, officials said. The issue is one of many threatening to bring down the Bulgarian coalition government, which on Friday survived its fifth no-confidence vote. Both Washington and Brussels have said they would punish the country if it continues work on South Stream. But EU Energy Commissioner GЯnther Oettinger said Friday that there was no point restarting talks on South Stream's legality — frozen when Russia annexed Crimea earlier this year — as long as Russia had a WTO case pending against EU law. "For the moment, [negotiations] are not being pursued for the very simple reason that our Russian counterpart has appealed to the WTO," Oettinger said through an interpreter. "We are appealing that that complaint should not be pursued [by Russia]." "We have a clear position, which is supported by member states. European law, which is currently in force, has to be taken into account," he said further, adding the EU had to be united as "a team." Russia announced last month that it was talking to the WTO about EU energy rules, which Russia says are inconsistent with WTO rules. On Friday, Ukrainian Prime Minister Arseniy Yatsenyuk ordered his country's energy sector to prepare for Russian gas cuts from Monday after Moscow and Kiev failed to resolve their differences over gas prices, raising fears of interruptions in gas flows to Europe.